We examined the mandibles of 377 individuals representing 25 species, 12 genera, 5 tribes, and 2 subfamilies of the Loricariidae, a species-rich radiation of detritivorous–herbivorous neotropical freshwater fishes distinguished by having a ventral oral disk and jaws specialized for surface attachment and benthic feeding. Loricariid mandibles are transversely oriented and bilaterally independent, each rotating predominantly around its long axis, although rotational axes likely vary with mandibular geometry. On each mandible, we measured three traditional and three novel morphological parameters chosen primarily for their functional relevance. Five parameters were linear distances and three of these were analogous to traditional teleost in- and out-levers for mandibular adduction. The sixth parameter was insertion area of the combined adductor mandibulae muscle (AMarea), which correlated with adductor mandibulae volume across a subset of taxa and is interpreted as being proportional to maximum force deliverable to the mandible. Multivariate analysis revealed distributions of phylogenetically diagnosed taxonomic groupings in mandibular morphospace that are consistent with an evolutionary pattern of basal niche conservatism giving rise to multiple adaptive radiations within nested clades. Correspondence between mandibular geometry and function was explored using a 3D model of spatial relationships among measured parameters, potential forces, and axes of rotation. By combining the model with known loricariid jaw kinematics, we developed explicit hypotheses for how individual parameters might relate to each other during kinesis. We hypothesize that the ratio [AMarea/tooth row length2] predicts interspecific variation in the magnitude of force entering the mandible per unit of substrate contacted during feeding. Other newly proposed metrics are hypothesized to predict variation in aspects of mandibular mechanical advantage that may be specific to Loricariidae and perhaps shared with other herbivorous and detritivorous fishes. 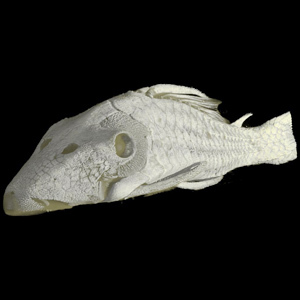 This specimen was made available to the University of Texas High-Resolution X-ray CT Facility for scanning by Nathan Lujan of Auburn University. Funding for scanning was provided by a National Science Foundation All Catfish Species grant (DEB-0315963). Funding for image processing was provided by an NSF Digital Libraries Initiative grant to Dr. Timothy Rowe of the Department of Geological Sciences, The University of Texas at Austin. The specimen was scanned by Matthew Colbert on 15 September 2004 along the coronal axis for a total of 1079 1024x1024 pixel slices. Each slice is 0.0829 mm thick, with an interslice spacing of 0.0829 mm and a field of reconstruction of 39 mm. A species summary of Panaque nigrolineatus on Fishbase.org. To cite this page: Dr. Nathan Lujan, All Catfish Species Inventory, 2005, "Panaque cf. 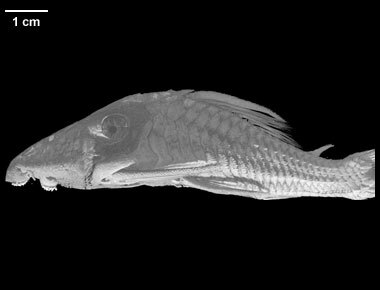 nigrolineatus" (On-line), Digital Morphology. Accessed April 25, 2019 at http://digimorph.org/specimens/Panaque_cf_nigrolineatus/whole/.